You are here: Home / Weekly Columns / Opinion / Generation Zero Gameplay Trailer: 10 Things You Missed. Generation Zero Gameplay Trailer: 10 Things You Missed. 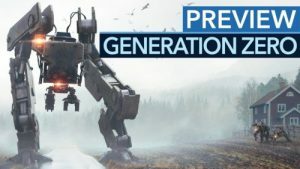 (ThyBlackMan.com) Generation Zero gameplay trailer landed in late August and gave us a glimpse of what Avalanche has been doing. Here are ten things that excite us about this upcoming open world action game. Just Cause developers Avalanche Studios showed off the Generation Zero gameplay in a video trailer and created a confusion. If you’re familiar with the artwork of Simon Stålenhag, you will notice that the Generation Zero game art looks similar to Simon’s project The Electric State. A war of words continues between Simon and Avalanche Studios on this issue. If you’re leaving a machine damaged, it will come again to kill you. In Generation Zero, the only way to stay safe from a machine is by completely destroying them. If you are leaving them in the active state, they will keep roaming around and come back. There are chances that you may not see them for hours or days, but they will persistently roam around if not killed. The robots you kill in Generation Zero can be helpful in upgrading your weapons and tools. When you kill a machine and if its major parts are not damaged, you can repurpose some of them and use them as high-tech enhancements for your weapons. Parts like night vision rifle scope can be taken from the slain machines. In the last few seconds of the Generation Zero trailer video, you will see a robotic spider that jumps towards the player. It looks similar to the sticky creatures found in the Half-Life video game. The four-legged creature in Generation Zero opens up its robotic arms and gives the same impression we have seen in Valve Corporation’s Half-Life series. Generation Zero is set in the 1980s and robots are invading the beautiful city of Sweden. November 14, 1989, is the date when you land in that creepy open world environment. You play as a young adult who is on a short trip to an island that is full of robots. You are accompanied by a group of friends and you won’t see any other human around yourself in the game. Players, as armed civilians, will use guerrilla warfare tactics to survive in the 1980’s Sweden. They will be putting traps, luring enemies, and killing the hostile machines by using hit-and-run tactics and by crippling them. You can play Generation Zero with up to three players in co-op multiplayer or you can go solo. The machines you will see in Generation Zero come in different sizes and shapes. They are equipped with unique tools, sensors, and abilities. You may find some of them flying while many others can walk, run and crawl. Machines use different weapons and tactics to attack humans but the good thing is when you damage some of their parts, the damage remains the same as no regeneration system is present in the game. Generation Zero features a full day/night cycle and the weather is unpredictable. According to the developer, these changes not only affect the player’s senses but the day/night cycle and weather play a major role in determining AI behavior. It’s unclear how deeply it affects the gameplay. There are four types of enemies in Generation Zero. These enemy machines are called Tick, Seeker, Runner, and Tank. Each of them has its own unique abilities. For example, Tick is the smallest of all but it’s very powerful. If you are too close to this small-sized creature, it will attack you with its sharp talons. It also comes equipped with a self-destruct mode. Seekers share your location information with their allies and invite more trouble on your way. Runners often roam in groups and use automated weaponry. The Tank is the heaviest and the biggest among all the enemies in Generation Zero. It is heavily armored and comes equipped with machines. The ground shakes when it walks. In addition to the new trailer, we also got to hear about Generation Zero closed beta which is slated for this fall. Avalanche has started accepting beta registrations for PS4, Xbox One, and PC platforms. Players can sign up by heading over to the game’s official website, though only a limited number of players will get a chance to play the beta. the beautiful city of sweden? just stick to playing games. not attempting to write about them.